We all feel stress at one time or another. It's a normal and healthy reaction to change or a challenge. But stress that goes on for more than a few weeks can affect your health. Keep stress from making you sick by learning healthy ways to manage it. The first step in managing stress is recognizing it in your life. Everyone feels stress in a different way. You may get angry or irritable, lose sleep, or have headaches or stomach upset. 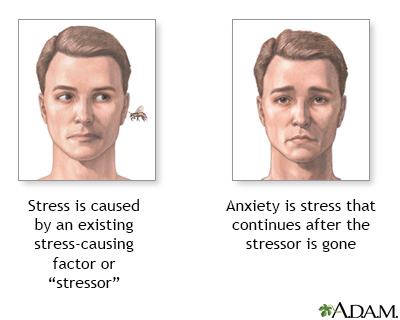 What are your signs of stress? Once you know what signals to look for, you can start to manage it. Also identify the situations that cause you stress. These are called stressors. Your stressors could be family, school, work, relationships, money, or health problems. Once you understand where your stress is coming from, you can come up with ways to deal with your stressors. These behaviors may help you feel better at first, but they may hurt you more than they help. Instead, use the tips below to find healthy ways to reduce your stress. There are many healthy ways to manage stress. Try a few and see which ones work best for you. Recognize the things you can't change. Accepting that you can't change certain things allows you to let go and not get upset. For instance, you cannot change the fact that you have to drive during rush hour. But you can look for ways to relax during your commute, such as listening to a podcast or book. Avoid stressful situations. When you can, remove yourself from the source of stress. For example, if your family squabbles during the holidays, give yourself a breather and go out for a walk or drive. Get exercise. Getting physical activity every day is one of the easiest and best ways to cope with stress. When you exercise, your brain releases chemicals that make you feel good. It can also help you release built-up energy or frustration. Find something you enjoy, whether it is walking, cycling, softball, swimming, or dancing, and do it for at least 30 minutes on most days. Change your outlook. Try to develop a more positive attitude toward challenges. You can do this by replacing negative thoughts with more positive ones. For example, rather than thinking, "Why does everything always go wrong?" change this thought to, "I can find a way to get through this." It may seem hard or silly at first, but with practice, you may find it helps turn your outlook around. Do something you enjoy. When stress has you down, do something you enjoy to help pick you up. It could be as simple as reading a good book, listening to music, watching a favorite movie, or having dinner with a friend. Or, take up a new hobby or class. Whatever you choose, try to do at least one thing a day that's just for you. Learn new ways to relax. Practicing relaxation techniques is a great way to handle daily stress. Relaxation techniques help slow your heart rate and lower your blood pressure. There are many types, from deep breathing and meditation to yoga and tai chi. Take a class, or try learning from books, videos, or online sources. Connect with loved ones. Do not let stress get in the way of being social. Spending time with family and friends can help you feel better and forget about your stress. Confiding in a friend may also help you work out your problems. Get enough sleep. Getting a good night's sleep can help you think more clearly and have more energy. This will make it easier to handle any problems that crop up. Aim for about 7 to 9 hours each night. Maintain a healthy diet. Eating healthy foods helps fuel your body and mind. Skip the high-sugar snack foods and load up on vegetables, fruits, whole grains, low-fat or nonfat dairy, and lean proteins. Learn to say no. If your stress comes from taking on too much at home or work, learn to set limits. Ask others for help when you need it. If you can't manage stress on your own, you may want to talk with your health care provider. Or consider seeing a therapist or counselor who can help you find other ways to deal with your stress. Depending on the cause of your stress, you also may find it helps to join a support group. Ahmed SM, Hershberger PJ, Lemkau JP. Psychosocial influences on health. In: Rakel RE, Rakel DP, eds. Textbook of Family Medicine. 9th ed. Philadelphia, PA: Elsevier Saunders; 2016:chap 3. American Academy of Family Physicians website. Managing daily stress. familydoctor.org/stress-how-to-cope-better-with-lifes-challenges. Updated December 21, 2016. Accessed October 15, 2018. National Institute of Mental Health website. 5 things you should know about stress. www.nimh.nih.gov/health/publications/stress/index.shtml. Accessed October 15, 2018.